At the ‘Herbstmesse 2017’ in Bolzano about 42,000 visitors come to the fair. The EURAC research also was at the fair. They had a booth where they presented FairCare. 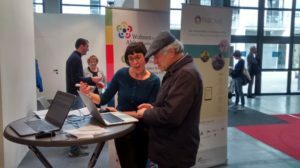 The visitors could test and try out the FairCare platform prototype and give feedback to it. This feedback will be considered and the platform will be adapted for the platform version 2 , which will be finished next year.